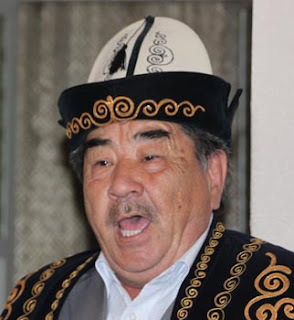 The epic poem Manas is central to Kyrgyz traditional culture and character, psychology and spirit. It is recited by specialists known as Manaschi, who hold a special place of respect in Kyrgyz culture. The Manas, named after the eponymous national hero, is a monumental work of 500,000 lines - the longest epic in the world. It is twenty times longer than Homer's Odyssey and Iliad combined, or about twice as long as India's Mahabharata. It is a work recounting the exploits of Manas and his descendants and followers. Battles against Kitay and Kalmak enemies form a central theme in the epic. However, the epic also includes a wealth of information about the everyday life of Kyrgyz people. The narrators, the Manaschi, passed the stories down from generation to generation. Not only were they esteemed for their knowledge, but also for their dramatic delivery. These verses are the treasures of the collective memory of the Kyrgyz. Although the epic is mentioned as early as the 15th century, it was not written down until 1885. The Manaschi (traditionally they are always men – although some women have taken to narrating the story as well) alternates between a rapid declamatory style when narrating factual information, and a strongly rhythmic recitative for depicting dialogue and direct quotation. They use dramatic gestures, changes in tone, pitch and facial expressions as an integral part of their performance – employing all to hold the attention of the audience. In many ways the recital of the epic by the Manaschi is indeed a performance. It almost seems as if he can see the scenes he is describing unfolding before him. He can waive his arms to indicate the armies approaching each other, his voice and facial expressions taking on the characters of the personalities as they play out their role. The scholar, Samar Musaev, comments that although memorising and reciting the text is important, the role of the Manaschi is not simply one of repeating verses which had been committed to memory. Rather it is that of a storyteller, bound by tradition and the basic elements of the epic. Musaev notes "Because any talented narrator's performance is guided by inspiration, he never performs word for word the same piece twice, but that doesn't mean he was inventing new verses - just adapting the basic elements to reflect the mood and context of the performance". Becoming a Manaschi carries considerable responsibility. Most Manashi consider that they have been endowed with a 'gift' for narrating the epic and the acquisition, or bestowing, of this gift is often linked to a dream. Such Manaschi are believed to be blessed, and audiences try to imbue themselves with their power - drinking drops of tea left in his cup, and one Manaschi reports that he often finds shirt buttons missing after a performance! In 1995 Walter May published an English translation of the version by the great Manaschi, Sagimbai Orozbakov, in commemoration of the presumed 1000th anniversary of Manas' birth. I picked up a copy in a Bishkek bookstore. 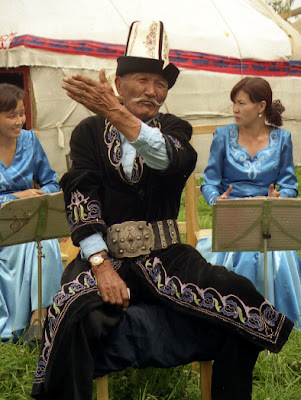 On an Uzbek Journeys tour to Kyrgyzstan you will have the chance to listen to a Manaschi during a performance of traditional music at a private home in Karakol. There are a few spaces available on the 2013 Kyrgyztsan tours. 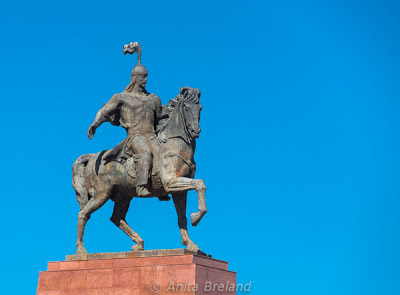 If you are not sure what Kyrgyzstan may have to offer apart from Manaschi, please review 5 Reasons to Visit Kyrgyzstan by writer and photographer Anita Breland, and follow the links to her other articles about Kyrgyz traditions. Update 6 December 2013: The United Nations placed the Manas on its List of the Intangible Heritage of Humanity on 4 December 2013.